After six years apart, three brothers Daniel (Philip Thomas), Tyler (Spencer Foley) and Jordan (Aren Buchholz) are reunited following the sud­den passing of their parents. 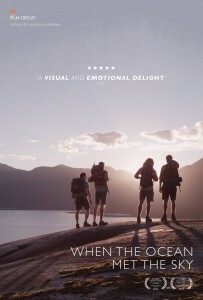 Directed by Lukas Huffman, the film sets the trio off on a hiking trip planned by their late par­ents for the brothers to complete in order to receive their inheritance. The three men set out on what is much more than just a family vaca­tion, as they must work through conflicts from the past. The Holmes boys go through a whirl­wind of anger, hate, laughter and finally hope as they work together to find the treasure they are searching for. Originally the prize the trio sought was an inheritance, however the plot shows us it’s the adventure in between that’s the true treasure. The hiking trip forces the brothers on a path of self-reflection as well as personal triumph. This film has fantastic scenery, maybe because it was filmed in beautiful British Columbia, our back­yard. The film left me in awe, I had goose bumps and tears from laughing so hard. The relation­ship Daniel, Tyler and Jordan have is one that any viewer with siblings can relate to. The brothers struggle with Daniel’s need to control, Tyler’s indecisiveness and youngest brother Jordan’s resentment. During the film, viewers get to see each brother’s relationships from each others’ points of view. This is one of the reasons I fell in love with the film, it created a family dynamic that I could relate to. We saw Daniel and young Jordan struggle to bond with Tyler because of his independence. Then the close bond between Jordan and Tyler was shown in a way that made viewers sympa­thize with Daniel for not having that bond. The brothers have a relationship dynamic at the beginning of the film that develops into one that we could only dream of. In the beginning, they were mere strangers and by the end they have reconnected and formed a bond only family could share. Huffman took a story of sibling rivalry and created the ultimate family development story. This is a film I would recommend to any audi­ence. The journey and growth of the brothers’ bond will inspire, the cinematography will awe and the acting will leave you with a need to call your loved ones.